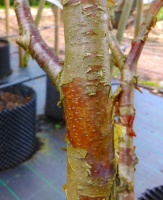 A medium sized deciduous tree with glossy green leaves which contrast well with the pink-red colours beneath the peeling bark. 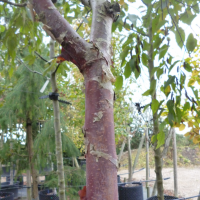 A member of a group of beautiful birches known best as the Chinese Red Birch, Betula albosinensis Fascination as the name suggests has to be one of the best. 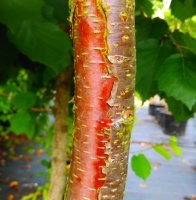 Hints of red, pink and orange in the trunk, which peels away like tissue paper, revealing the vivid colouration of the new layer that often also has a white bloom. This stunning Birch is very different to what people come to expect from a Birch as the trunk is a rich orange brown colour, peeling off in the same way as other Birchs to reveal another layer of rich orange brown beneath. With smooth, golden peeling bark and scented leaves, twigs of wintergreen. Definitely worth a place in any collection. A most attractive tree with pinkish- orange fawn bark. Similar in appearance to B. ermanii, to which some authorities place the form grown in cultivation. A very beautiful fast growing Birch of easy constitution. Bright green heart shaped leaves and highly attractive creamy white bark with pink tinges. Glorious chalk white peeling bark on the trunk and right up into the branches certainly makes this unusual Birch a tree for the connoiseur. Originated from Central Asia.